I decided to upload a new video to YouTube from the Tim-vault of 2009! While visiting relatives in Malaysia, our cousin took me and my sister to Genting Highlands with his family, just for fun. Compared to North America, this theme park was pretty tame, but it was still fun. It’s even more fun when you make your own fun. While eating dinner at the First World Plaza (a part of the entire resort area) I looked up and saw the “Euro Express,” one of the indoor thrill rides that make up the First World Theme Park. It’s more or less a kiddy roller coaster. I had a lot of pent up energy and I noticed people (a good mix of south east Asians, other Asians, and some Arabs) didn’t really scream and shout on thrill rides as I’ve grown accustom to back home. I though to myself, wouldn’t it be fun to go on that little ride, lean over the edge of the car to look at the families that are trying to have a nice meal and the oblivious bystanders below, while shouting at the top of my lungs “we’re all going to DIE,” making them think I was crazy while filling the building with sound of my screams? The Plaza was not a noisy place to begin with. So I agreed with myself, yes, that would be fun! This is an amusement park after all! Good idea Tim! I also thought it would be appropriate to scream “we’re all going to DIE” in a more common language, which is Bahasa. So my cousin taught me the very useful phrase: Sekarang kita semua nak mati. Aaaand my sister and I got into the line for the “Euro Express” (mostly filled with family-aged kids, mothers/fathers with youngsters, etc) and got into the roller coaster car. I turned my camera on and started to record. I screamed the ENTIRE ride. I looked down below and across the different levels of the shopping area, tried to make eye contact with confused visitors, and screamed AT them. At their faces. We got off the ride and I checked my camera. In my haste, I somehow thought it failed to record at all. My throat felt quite sore at this time, but hey, we’re here; we have nothing better to do, so lets try it again! So we lined up and got on and I did it again! And I promptly bought a bottle of overpriced water after that. Ugh my throat was sore. It even felt a little sore as I watched my videos again, hahaha. Long story short, both times we went on the ride, my camera DID record my antics and screams, but the video mode it was on only limited it to 1-minute clips. Usage of convenient technology FAIL along with the obvious Bahasa language FAIL. But making your own fun memories WIN. ahahahahahaha I LOVE IT. 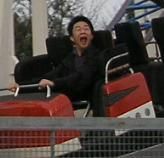 I need to go to a random amusement park in asia next time and do that. I def noticed in HK people pretty much never scream on rides (not that there are many that are scream-worthy by my standards). Johnson - i am mentally unstable. at least, thats what my imaginary friends tell me.